great picture, no words needed here. the reunion is great for all. So right - when I look at this - I do know how much they missed each other. It has been a long separation. Thanks! Welcome home, young man!! I know your family are excited! We can't wait to see him at Thanksgiving!!! Thank you - I love that picture - and in a few weeks, we will see Alex and his sweet little family!! Hugs! This picture makes the saying "A picture is as good as a thousand words" very true. What wonderful reunion! Thank you for sharing. I believe you are right - it does say it all!! Hugs! Happy tears here, the emotion is contagious!!!! My embroidery teacher made shirts for the homecoming of her son, for the DIL and granddaughter. They said, "Outa my way/ I'm here to get my man." These are such joyful times. So sweet - thank you!!! wonderful reunion! Hope he is home for a while. Thank you - I believe he is home for a while!!! Tear Jerker moment - Pleased Alex is home safely. They are so very happy - thanks, Lillian!! 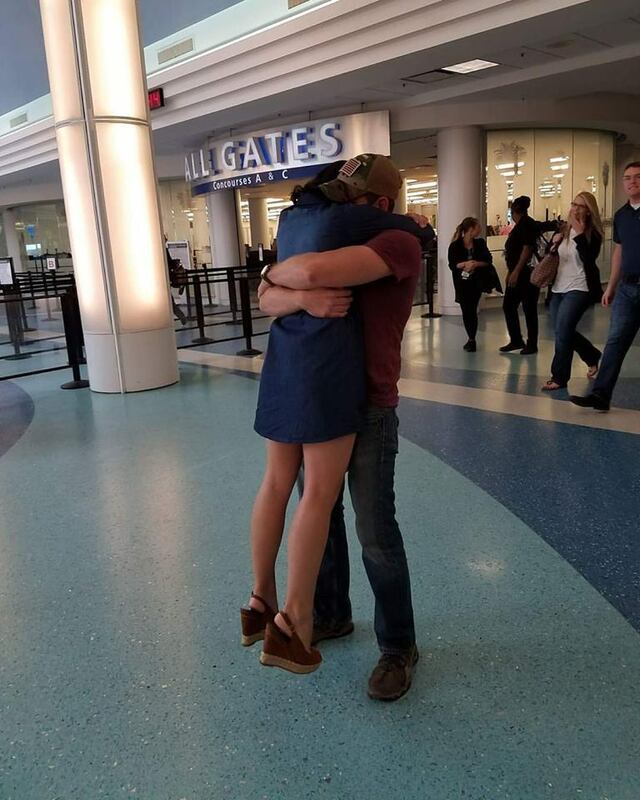 I never tire of seeing the reunions too - but, I get to choked up and cry every time. Happy, relieved emotions so very raw. Thanks Kim! I have tears of joy for you and your family.......fantastic news!! There have been a lot of happy tears!! Thank you! Pure joy! Your heart must be so full. Joy - the perfect description!!! I believe the picture says so much. You can almost feel it. Happy dancing for sure! I am so happy for you all. Have a wonderful holiday season. That just about says it!! !